"A Minecraft skins pack of the Rocky Bytes most awesome Minecraft skins of 2014." There are many talented creations that Minecraft inspires. There are thousands of mods, world creations, and more, but things get a lot more fun and creative when people start designing their own skins. This skins pack is of the chosen Rocky Bytes most cool Minecraft skins you can find on this article: Most Awesome Minecraft Skins of 2014. These skins have been specially chosen and picked because of their creativity, design, appeal, and how fun they are. 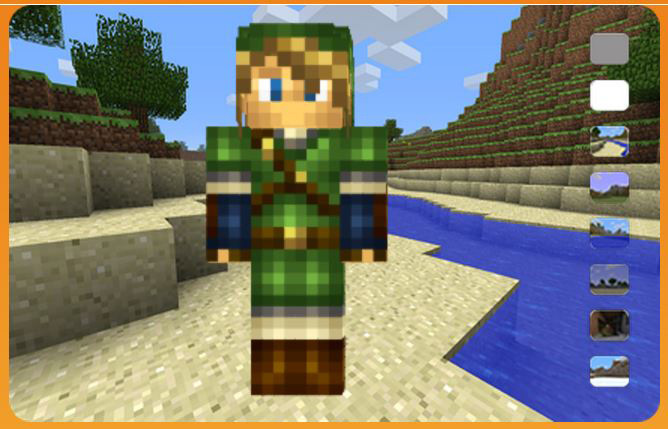 The Minecraft skins that you will find in this download are the skins that were chosen in the Rocky Bytes Most Awesome Minecraft Skins of 2014 article of the select few skins that were mentioned in the article. You will find several football (or soccer) Minecraft skins, link skins, Pokemon skins, Minecraft girl skins, and various other Minecraft skins that were made by various designers. These skins are pretty well done, so it is a certainty that people will enjoy the detail that has been put into them by their designers. If you are interested in seeing what the skins look like, please check out the article that is linked in this review for more information before you download. The skins come in PNG format, which is used by the game, to be uploaded to the Minecraft servers using your account information. In order to use these skins, make sure that you have an official Minecraft account so you can add these skins to your account so everyone can see them when you all play on the same server. Moreover you have to download the Minecraft's game.